Today I have Shakespeare for kids on my mind. Because WS’s language, with its old words and complicated syntax, is a challenge for young readers, it isn’t unusual to find versions of these tales re-penned specifically for children. To help these solicitous brothers, the Lambs redact the tales, omitting the salacious and overly violent parts. In Mary Lamb’s version of Cymbeline, for instance, the mole that Iachimo sees while taking her bracelet from the sleeping Imogen is on her neck rather than her breast, and Cloten is barely mentioned (presumably so that we don’t need to see his head sans torso). 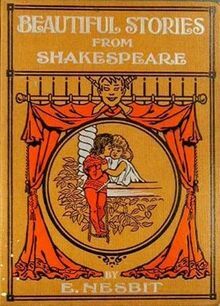 E. Nesbit’s Beautiful Stories from Shakespeare, with its much shorter versions of only 20 plays (no histories), is for much younger readers, and even the illustrations (in the US edition, at any rate) portray the characters as children rather than adults. In truth it was not easy to arrange the story simply. Even with the recollection of Lamb’s tales to help me I found it hard to tell the “Midsummer Night’s Dream” in words that these little ones could understand. So the trunk was carried into Imogen’s room, and that night she went to bed and to sleep. When she was fast asleep, the lid of the trunk opened and a man got out. It was Iachimo. The story about the jewels was as untrue as the rest of the things he had said. He had only wished to get into her room to win his wicked wager. He looked about him and noticed the furniture, and then crept to the side of the bed where Imogen was asleep and took from her arm the gold bracelet which had been the parting gift of her husband. Then he crept back to the trunk, and next morning sailed for Rome. As I read through Shakespeare’s Cymbeline, I sometimes find myself yearning for the simplicity of the Lambs’ or Nesbit’s versions. WS’s syntax is at times so convoluted that I need a map to guide me through each sentence. Which is the subject, which the verb; what’s the referent for that pronoun? Even the experts can’t agree (my Pelican version is rife with notes that end with question marks). Many thanks to the University of Florida and The Gutenberg Project for making editions of these books, complete with illustrations, available online. This entry was posted in Shakespeare, YA Lit and tagged Charles Lamb, E Nesbit, Mary Lamb, Shakespeare. Bookmark the permalink. I never could manage the Lambs’ versions, so much so I no longer have a copy. I remember them as mostly bare plot and moralistic asides, but I may be doing them an injustice. I wasn’t aware that Nesbit tackled the subject, Lizzie, so thanks for drawing attention to that. You’re welcome. And thanks for the reblog. Both are available online, so no need to hunt down copies. To parallel our act-by-act synopses with commentaries, here is Lizzie Ross’ reminder of re-tellings for younger audiences. Loved this post. 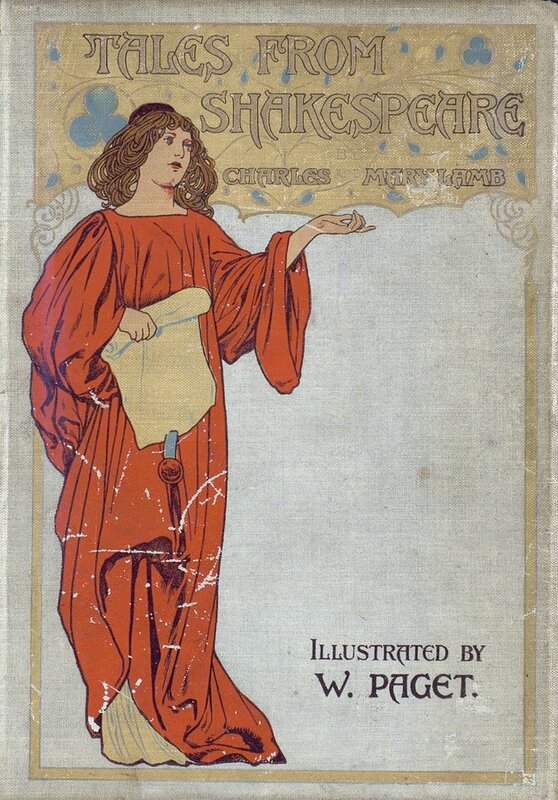 For all my love of E. Nesbit I’d never come across her re-tellings of Shakespeare; will look for it now. I used to use Lamb’s Tales to familiarize my son with the plot before we went to see a Shakespeare play, but although I had a lovely illustrated edition, never read much of it myself as a child. Thanks, Josna. I’ve had a copy of Nesbit’s Shakespeare on my shelf for years, but it’s an abbreviated version with only half the original “tales”. All this time I thought it was complete until I did the research.